In 2014, St. Louis faced a cataclysm. On August 9, a white police officer, Darren Wilson, shot and killed a young black man named Michael Brown in Ferguson, Missouri. Protests started the next day and continued for over two weeks, only to break out again the night of November 24 when a grand jury announced its decision not to indict Wilson. As a result, St. Louis has earned the reputation of the most segregated city in the United States. People are scared to visit St. Louis because they think it is too dangerous. In 1849, between destruction and disease, St. Louis had it even worse. 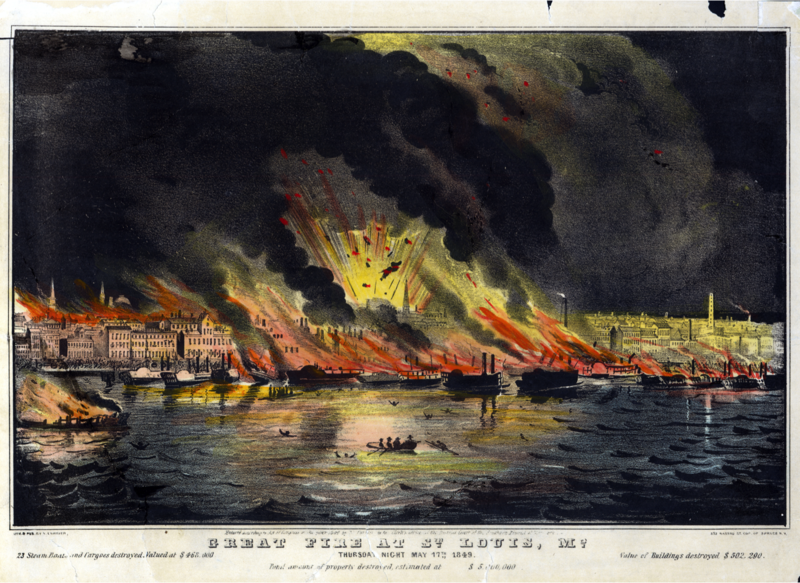 The city of St. Louis almost perished between the Great Fire and the Cholera epidemic. And yet the city emerged from that year stronger and better. On May 17, 1849, fire broke out on the White Cloud, a steamboat moored on the city’s riverfront. When the rope tying it to the dock burned, the ship turned into a floating torch that set 31 other steamships aflame. Soon flames leapt to the wooden warehouses on shore and threatened to take down the entire city. Only the courage, daring and self sacrifice of a volunteer fire captain named Tom Targee saved St. Louis from complete destruction. Targee came up with the idea of creating a firebreak by blowing up buildings to stop the conflagration from spreading. A barrel of gunpowder exploded as he was carrying it into the Phillips Music Store on Market Street, killing Targee. Only two other St. Louisans lost their lives during the Great Fire, but fifteen blocks were leveled at a time when St. Louis stretched just three-quarters of a mile back from the Mississippi. Damages totaled $5,000,000 to $6,000,000, worth close to $190,000,000 today. Simultaneously, St. Louis was in the throes of a cholera epidemic that carried away 4,547 lives. With a total population of 105,000 according to the 1850 census, St. Louis was harder hit in proportion to its population than any other city in the United States. With property lost on one hand and lives on the other, St. Louisans came together as they never had before, and a modern city was born out of the ashes of a quaint, French town. With insurance money pouring in, merchants replaced charred warehouses with state-of-the-art commercial buildings. The city government appropriated funds for the first sewer system to prevent future outbreaks of cholera, putting St. Louis in the vanguard of urban environmental planning. The city also convened a Board of Health, and citizens voted for a tax for public education that gave the city some of the best public schools in the nation. Can we the citizens use this tragedy to inspire us to create a better city, a model of racial tolerance for the nation? The Ferguson Commission Report challenges us to do so. In an 198-page document, the Commission calls for specific measures to create: Justice for All, Youth at the Center, Opportunity to Thrive and Racial Equity. These proposals are not Band-Aids to solve small, local problems, but thoughtful measures to change attitudes and ways of life, changes that will make St. Louis a great place. Let us hope the tragic occurrences of Ferguson 2014 may provide the inspiration for St. Louis to come together.